The Philadelphia Police Department said it will implement a tattoo policy in the aftermath of the backlash from Officer Ian Lichterman's forearm symbol. 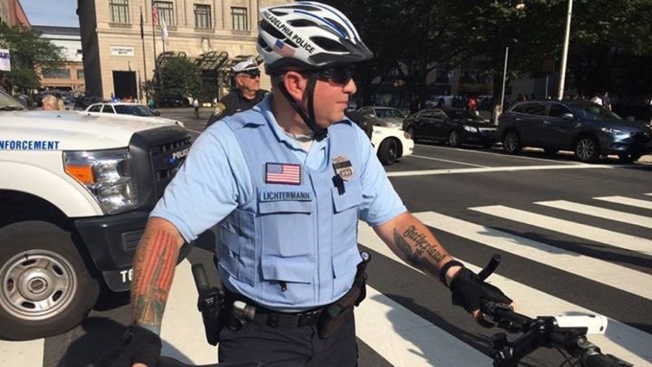 A photo posted to Twitter of Philadelphia police Officer Ian Lichterman, which shows a possible Nazi tattoo on his forearm. A Philadelphia police officer, whose arm tattoo of an eagle created a social media firestorm in September because some linked it to a Nazi German symbol, has been cleared in a department investigation, police said Tuesday. Mayor Jim Kenney at the time described the photograph of Officer Ian Lichterman posted to Twitter Sept. 1 as "incredibly offensive." "I know many others do as well," he said a day after the photo was tweeted. The photo showed Lichterman, a bike cop, standing with his bicycle and most of a tattoo on his left forearm that appeared to be an eagle below the word "Fatherland." The eagle was drawn in a way some linked to a prominent Nazi German symbol. A police spokesman said Tuesday that the investigation of Lichterman's tattoo cleared the officer last month and that he remains in his post. The police department remains without a tattoo policy, according to Philly.com, which first reported the end of the investigation into Lichterman. He was hired by the department in April 2000, according to city records. Despite the end of the investigation, Kenney said in a statement he believes the tattoo is "completely inappropriate" and that the city will work to foster a "culture of acceptance, diversity and inclusion throughout the police academy and the force." He went on to credit the department's professionalism amid the many protests in Philadelphia during January. "Additionally, PPD will continue to conduct thorough background checks and psych tests for new recruits. We also work to foster a culture of acceptance, diversity and inclusion throughout the police academy and the force. "That spirit has been on display the past several weeks as officers have protected thousands of individuals’ right to protest and done so with respect and with dignity, and not a single arrest. I am confident that the actions of this officer is not reflective of our entire force." A police spokesman said the department is working on a tattoo policy to implement in the near future, but details are not yet finalized. Troopers with the Pennsylvania State Police are currently undergoing body inspections by superior officers for any tattoos that are visible to the public, according to the Pittsburgh Post-Gazette. The administration has even pushed for troopers to have any such tattoos removed, but the demand is now in negotiations between officials and the troopers' union.